This week’s inks are a bit dull due to the stormy weather in Istanbul recently. I promise my next batch will be more colorful. Sheaffer Snorkel Crest + Montblanc Leo Tolstoy Sky Blue: I got this pen by a swap with Mr. KGK I gave him the gray colored Sheaffer Snorkel and got this Buck Skin Tan color in return. Actually I still keep both pens. I am a monster! For the ink, I was keeping it on my desk, thinking that it is a classic dark blue with no soul. I am a fool as well. This is a great, deep color. Montblanc Rouge&Noir Coral + Montblanc Alfred Hitchcock Red: This pen belongs to Mr. KGK as well. I might have seized it 🙂 (I told you I am a monster) And I think this pen is quite tiny for his giant hands. Apart from the joke, maybe it will be mine one day. Why not? And the ink is dedicated to the legenday director of thriller movies Alfred Hitchock. Lamy Studio + Louis Vuitton Gris Romantique: I have Lamy Studio for a very long time and I don’t use it often because I am not getting along well with the grip section of this pen. I am thinking about selling it so I wanted to use it for a while before I put it into the market again. Nope; I don’t like its grip section. And I have Louis Vuitton Gris Romantique in it. I love this ink. Pilot MYU 701 + Sailor Jentle Blue Black: Pilot MYU was in my wish list for a long time. And I snapped it! I am so happy that I have this pen. Wish us good luck. And I have Sailor Jentle Blue Black in this pen. It is a very interesting ink which is navy blue when wet but more greyish when dried. Lamy 80 + Sailor Jentle Grenade: I love Lamy 80. Especially with the Oblique Broad nib I have. It emphasizes every ink color. 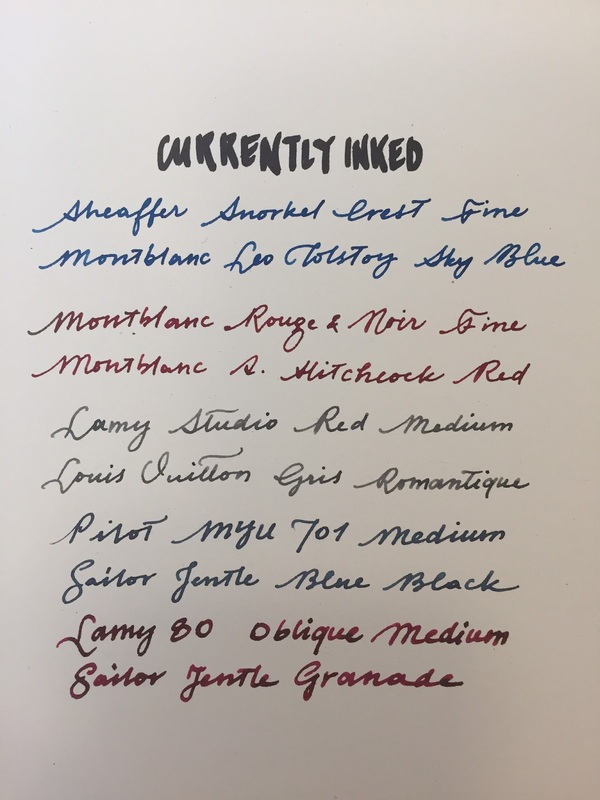 And Sailor Jentle Grenade is one of the old series of Sailor inks and maybe the best among them. I love that ink and if my bottle happens to finish, I can consider buying the substituiton of Grenade, Sailor Four Seasons Oku-Yama. What is your favorite ink and pen combos recently?